Fourteen local farmers across Northern Ireland are making their final preparations ahead of Bank of Ireland Open Farm Weekend 2018. Running on Saturday 16th and Sunday 17th June, the popular initiative gives consumers and their families the opportunity to visit farms across Northern Ireland, for free. Armagh Apple Farm is run by the Troughton family and is based at 73 Drumnasoo Road, Portadown, BT62 4EX, will be open on Saturday 16th and Sunday 17th June from 10am to 5pm, both days. Visitors can walk around the orchards and see the production process for their apple juice and cider drinks. There will be a beehive demonstration as well as a selection of market stalls featuring local traders. Blackberry Hill Farm is run by Harry McGaffin and is based on the Ballymacanallen Road, Gilford, BT63 6AE and will be open on Saturday 16th and Sunday 17th June from 11am to 5pm daily. The farm has European Angus cattle and visitors will get the chance to see other animals including baby chicks and sheep. There will be a cookery demonstration by the Livestock and Meat Commission running both days. There will also be pony rides. Broughgammon Farm is run by the Cole family and is based at 50 Straid Road, Ballycastle, BT54 6NP. The farm will be open on Saturday 16th June from 11am to 5pm. There will be lots to see and do on the farm including a Mini Artisan Market, Economusee Guided Tour, Children’s Seasonal Farm Walk, Street Food Trailer and a plant swap. They will also be unveiling their brand new Farm Cafe and Shop. Bullsbrook Farm, run by Roy McMurray, will be open on Saturday 16th from 10am to 5pm and Sunday 17th June from 2pm to 5pm, at 26 Black Bog Road, Dromore, BT25 1EH. The farm has an agricultural mini museum featuring old horse and farming implements. Visitors are welcome to bring a picnic along and there will be bread making on an open fire in one of the restored farm buildings in the yard. The River Lagan runs through the farm and provides habitat for various wildlife and birds. CAFRE Greenmount Farm, 45 Tirgracy Road, Antrim, BT41 4PS will be open on Saturday 16th from 11am to 5pm and Sunday 17th June from 12noon to 5pm. The dairy unit will be open for visitors to see the 40 point milking parlour. There will be machinery displays as well as planting and floristry demonstrations and sheep shearing and health and safety demonstration. There will be lots of activities for children throughout the weekend. Churchview Farm, run by star of the UTV Rare Breed series Geoffrey Ringland, is taking part for the first time. The goat farm is based at 17 Kilkinamurray Road, Ballyward, Castlewellan, Co Down, BT31 9QR and will be open on Saturday 16th June from 11am to 6pm. Visitors will be able to meet the goats and there will also be a display of tractors, machinery and lorries. There will be special activities for children. Castlescreen Farm is run by Damien Tumelty and is based at 32 Castlescreen Road, Downpatrick BT30 8TE. The farm will be open on Saturday 16th and Sunday 17th June from 11am to 5pm. Visitors can tour the farm and meet the Dexter cattle and other farm animals including sheep, chickens, pigs, ducks and geese. There will be farmers’ market stalls, competitions and a play area for children and a Dexter beef barbeque. Dolan’s Social Farm is run by Malachy Dolan and is based at 50 Glennasheevar Road, Knockaraven, Garrison, Co Fermanagh, BT93 4AA. The farm will be open on Saturday 16th June from 11am to 5pm. There will be farm walks with a quiz along the way as well as a Landrover Safari and a display of old agricultural machines as well as the opportunity to meet animals mainly from their beef cattle herd. Drumrammer Farm is run by Victor Turtle and is based at 15 Drumrammer Road, Ahoghill, BT42 2RD and will be open on Saturday 16th from 11am to 4pm and Sunday 17th June from 12noon to 6pm. The dairy farm uses robotic milking and there will be the chance to watch the cows get milked. Visitors are welcome to bring a picnic along and there will be samples from Glanbia Cheese to taste. On Sunday at 5pm, there will be a special worship in wellies service on the farm. Hillstown Farm, 128 Glebe Road, Randalstown, BT41 3DT will be open from 10am to 5pm on Saturday 16th June. The farm, which also has a farm shop and cafe on site, will have barrel rides for children and a humdinger burger eating contest for the adults. Hillstown Brewery will have sampling for over 18s and there will be different competitions throughout the day. Long Meadow Farm, run by the McKeever family, will be open on Saturday 16th from 11am to 5pm and Sunday 17th June from 12 noon to 5pm. The farm is based at 87 Loughgall Road, Portadown, BT62 4EG. There will be orchard tractor tours and a wheelbarrow park and ride for children, as well as a treasure hunt with prizes. Kennedy Bacon will be providing a pig-on-a-spit. As well as cider tastings for over 18s, there will also be free tea, coffee and ice cream for visitors. Mossbrook Farm is run by Moore Tweed and is taking part for the first time. 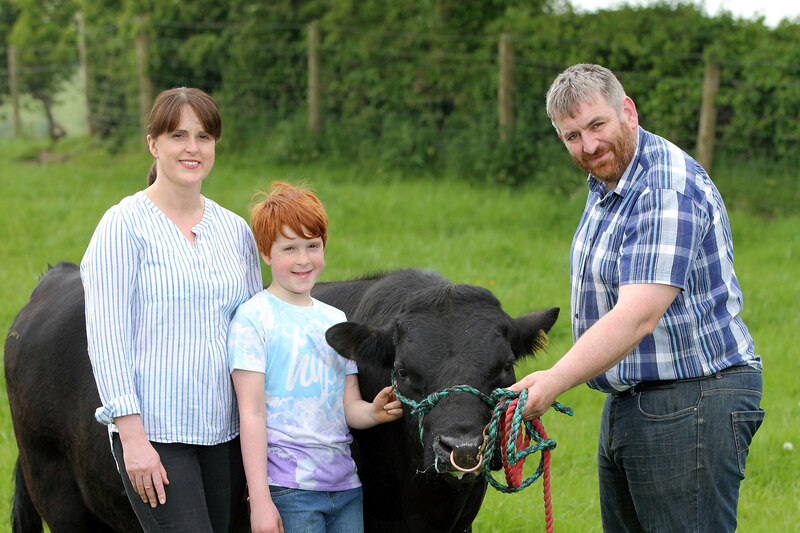 The beef and sheep farm, which also incorporates Farm House Treats which is run by Moore’s wife Jennifer, is based at 20 Mossbrook Road, Carryduff, BT8 8AJ and will be open on Saturday 16th June from 11am to 5pm. There will be sheep shearing demonstrations, a vintage tractor display and face painting for children as well as some special guest animals – Mourne Alpacas. Murray’s Farm, is run by Gareth, Christina and Yvonne Murray and is based at 32c Old Church Lane, Aghalee BT67 0EY. The poultry farm will be open on Saturday 16th and Sunday 17th June from 10am to 4pm, both days. The farm is a supplier to Moy Park and there is a viewing gallery to see the chickens. A display of vintage machinery will be in the yard and there will be a range of kids activities. In addition, there will be a BBQ for visitors to taste a variety of Moy Park products. Walls Farm is run by Murtagh Walls and is based at 27 Bryansford Road, Hilltown BT34 5XY. The beef and sheep farm is open on Saturday 16th from 11am to 5pm and Sunday 17th June from 1pm to 5pm. There will be a cookery demonstration by the Livestock and Meat Commission running both days as well as a drone demonstration and a machinery display. Pony rides will be available and there will be different activities for children. Families can plan journeys to all 14 participating NI farms on the website which lists the various opening times and activities which are unique to each farm. Visitors are advised to wear sensible footwear and are welcome whatever the weather as the farms will be open come rain or shine. On each farm, there will be the opportunity to enter a free draw to win a food hamper filled with lots of local food produce, kindly provided by the Ulster Farmers’ Union. Participating farms are also supporting the UFU Centenary Charity Appeal for Air Ambulance NI, which provides high quality critical care where and when it is needed most and special activities will take place on each farm to raise funds for the charity. The Ulster Farmers’ Union led initiative, principally supported by Bank of Ireland UK, has been running since 2012 and has attracted almost 90,000 visitors. Bank of Ireland Open Farm Weekend is also sponsored by NFU Mutual, Cranswick Country Foods and ASDA. The weekend would not be possible without the help and resources of CAFRE, the Young Farmers’ Clubs of Ulster, the Northern Ireland Food and Drink Association, Food NI, and DAERA. For more information, follow on Twitter @BOIopenfarm and like Open Farm Weekend on Facebook. Visitors are encouraged to share their pictures on farms using the hashtag #boiofw18.